Mercy Ministries News: Mercy Resident Gives Birth – Wishes to Thank All Our Supporters! Mercy Resident Gives Birth – Wishes to Thank All Our Supporters! On Friday August 15th at 1:38 am, baby Elijah was born to Mercy Ministries resident, Kara. After much prayer, Kara made the choice to parent her baby. Just four days after she gave birth, Kara graduated from the Mercy Ministries program. Kara will be going home to care for her son, and she plans to go back to school to become a medical assistant. Kara also plans to get involved in the unwed mothers ministry through her church to help other girls who are going through what she has been through. According to Kara, “Elijah is the most precious gift that I’ve ever been given and I thank God every day for this beautiful life He’s entrusted into my care.” Kara wanted you to know that she is doing fine and that baby Elijah is healthy and beautiful. 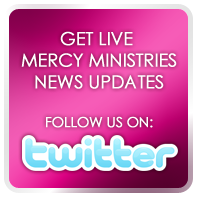 Mercy Ministries would like to thank our supporters for your continued prayers and support. Because of your help, lives are being saved and restored every day. Congratulations Kara! We are so proud of you for choosing life for baby Elijah!